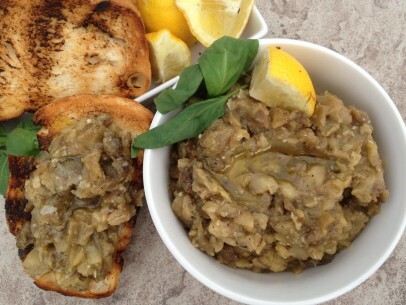 There couldn’t be a simpler or more delicious way to eat eggplant! Not a fan of eggplant? Melitzanosalata will knock your sox off and have you waiting for eggplant season to roll around next! This very traditional Greek summer dish is authentically vegan and is so incredibly flavorful you will be so surprised by how few ingredients you’ll need and how easy it is to make. 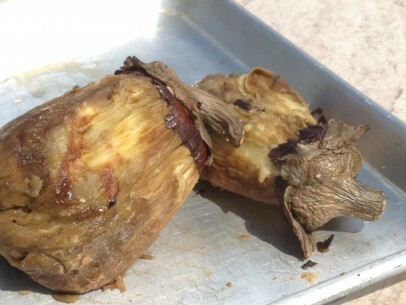 A couple of medium eggplants, an open flame (a grill ideally but a broiler will do! 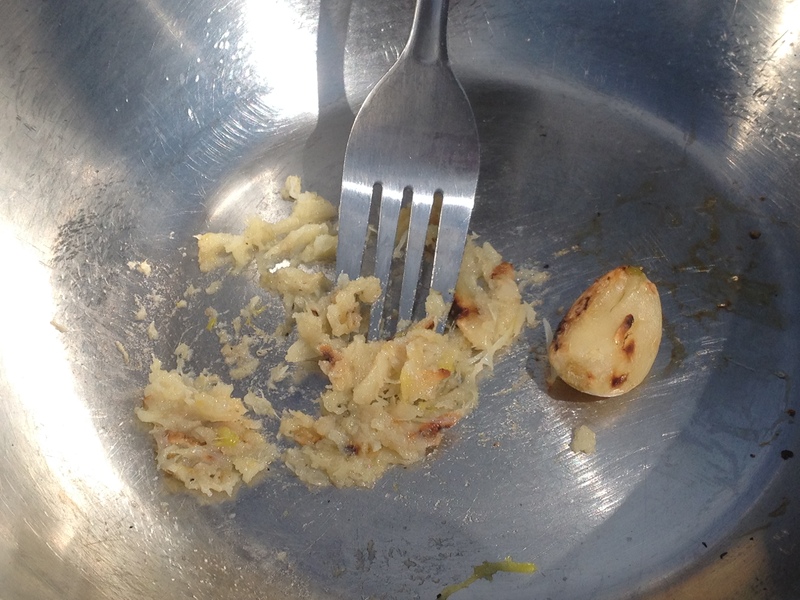 ), roasted garlic cloves, fresh lemon juice, salt and pepper – thats it! Slather this yummy goodness over grilled bread, scoop it up with homemade pita chips or put as a side to just about any dish and you will not be disappointed, I promise! Grill 2 medium eggplants over high flame (or under broiler) – poke holes in them first! Turn eggplants until all sides of skin are blackened and eggplant juices begin to seep out. 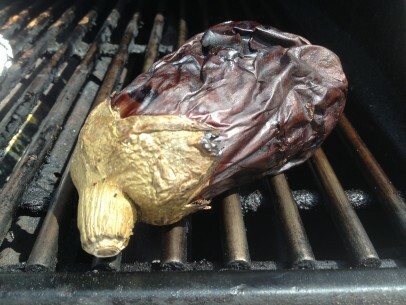 Use 2 smaller eggplants instead of 1 large – it will char faster! Wrap 3 large cloves of garlic in foil and add to grill until they are roasted and soft. Mash with back of fork to get a paste, add 1/2 tsp salt/pepper and set aside. Gently peel skins off eggplants – they’ll come right off, chop up meat into small pieces and mash with a wooden spoon or dinner fork until eggplant is as chunky or as smooth as you like. Add seasoned mashed garlic paste, 1/3 cup good quality olive oil and 2 tbsp fresh squeezed lemon juice. Mix very well until completely combined. That’s it! Serve over grilled bread or with homemade pita chips, all on its own or as a side dish to just about anything! This recipes should give you a little over 2 cups of melitzanosalata. melitzanosalata drizzled with olive oil – make it as chunky or smooth as you like! Amazing!! 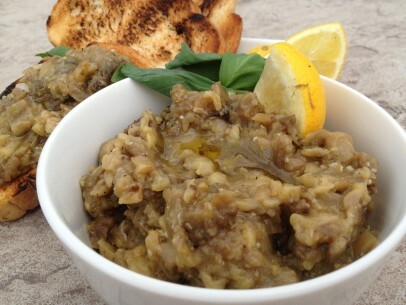 Best eggplant I’ve ever tried- and I Love eggplant!!! I love eggplant, too. This looks delicious! Hi – do you have to serve this warm or is it good at room temp or cold? Thanks! This is so good! So glad I found your website and looking forward to your Dolmas recipe tomorrow! © 2019 The Greek Vegan. All Rights Reserved.